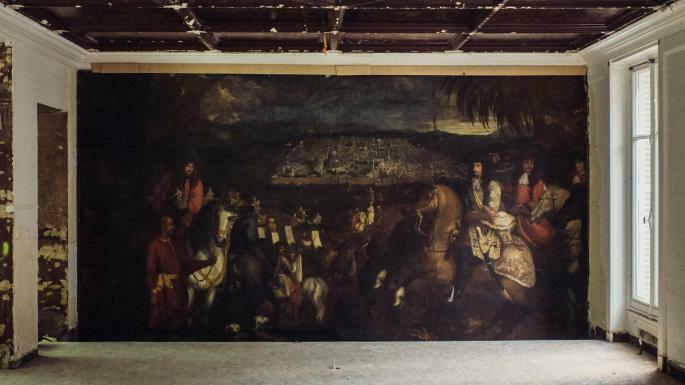 A 17th-century canvas discovered behind an office wall in Paris may have been hidden there to save it from Nazi looters, art experts believe. The five-metre-long oil painting, which has been described as exceptional, was found by workers converting the office into a luxury boutique for Oscar de la Renta, the fashion brand started by the Dominican designer who died in 2014. “It is a very fine painting, of very beautiful aesthetic quality,” said Benoît Janson, a Parisian art restorer whose Atelier Nouvelle Tendance studio is cleaning the work. “It was totally unexpected to find it there in the most banal of offices. We are discovering very exceptional things as we restore it,” he added. Experts have established that it was created during the reign of King Louis XIV in 1674 by Arnould de Vuez, a painter who worked with some of the finest artists of his day. It is believed to have been among four works produced by de Vuez to decorate the Château de Bercy, a former manor in a district that is now part of Paris. The painting shows the Marquis of Nointel, Louis XIV’s ambassador to the Ottoman empire, riding to Jerusalem. Workers converting the office into a shop removed a wooden partition to find padded cloth behind it, and the canvas on a wall behind that. Jeang Kim, a designer, told the New York Times that when the canvas was discovered: “Everyone freaked out. It was like finding a mummy. I turned off my phone immediately and just looked at it. Nothing like this had ever happened in my work before.” Experts have yet to determine why the painting was hidden in the 19th-century office block near the Champs Élysées. One theory is that it may been placed there to escape the Nazis, who took about 650,000 artworks from France during the occupation, notably from Jewish families. The discovery has come as a mixed blessing to Alex Bolen, the chief executive of Oscar de la Renta, one of the world’s most expensive fashion brands whose wedding dresses cost up to $14,000. Mr Bolen had hoped to open his boutique for Paris Fashion Week this week but has had to delay because Mr Janson will not finish his restoration of the painting until late Spring. Mr Bolen might have saved time by having the canvas removed, but his wife said that he risked 100 years of bad luck if he did so. He now hopes that the painting will turn out to be a significant asset. Luxury brands are constantly trying to find an edge, and to stand out from their rivals. Few things are more chic than having a geniune 17th-century canvas in your latest boutique. Mr Bolen has been given permission by the building owners to keep the canvas during his tenancy if he pays for its restoration.